Gulf front, two bedroom and two bath unit, with bunk beds and a fold-out sofa that sleeps eight. This unit has unbelievable unobstructed views. This unit is in great condition and located in a quiet, private, low rise complex with only 10 units in building. 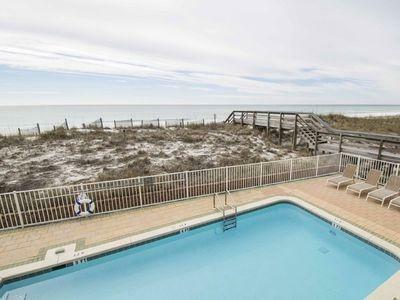 This condominium has covered parking and and a gulf front pool. It is nicely decorated with carpet in the bedrooms and tile floors throughout the rest of the unit, new bedding, crown molding and beautiful granite counter tops and a new AC. The unit is updated, and the building is currently getting new balconies, and the exterior painted. This condominium is a small private complex with beach service included (umbrella and beach chairs) and is never crowded.Work on the balconies is now complete and the building has just been painted.